Today, Kanye West made a newsworthy tweet that was much, much less disheartening than his last one: His new album has been retitled The Life Of Pablo. 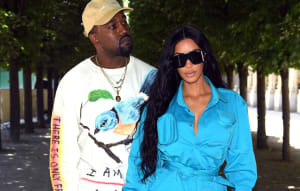 He had previously revealed the album's initials, and offered a pair of Yeezys and tickets to his Yeezy Season 3 presentation at Madison Square Garden to the person who guessed it (none of our suggestions matched, unfortunately). “Pablo” could refer to Pablo Escobar or Picasso, who Kanye once compared himself to. Whoever it is, Kanye did shout out “I feel like Pablo!” on “FACTS.” So it's an important Pablo. He's also significantly changed and reshuffled the tracklist, which he previously shared in late January. Among the changes: “Ultra Light Beam” has taken the top spot instead of “Nina Chop,” “Waves” has been replaced by “Freestyle 4” and the Kendrick Lamar-featuring “No More Parties In L.A.” has been bumped in favour of “Feedback.” It's also possible that “Waves” and “No More Parties” could have just been retitled. We won't just know until...tomorrow?? Damn.